What is the best fire extinguisher type for your workplace? So what is the best fire extinguisher type for your workplace? This is a common question to our office from new businesses so here is a quick overview. Workplaces should have at least one general purpose fire extinguisher for each 200 sq metres of floor space and also a minimum of two per floor. If the floor space is less 100 sq metres only one general purpose fire extinguisher type is required. 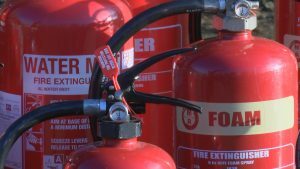 So what is a general purpose fire extinguisher type? A general purpose fire extinguisher is either a water or foam fire extinguisher. They can be either jet or spray types. City Fire Training recommend that small workplaces / offices should select 3 Litre fire extinguishers as they are not too heavy for all staff. Workplaces must also have other fire extinguishers to protect other risks. For example an office would have an appropriate number of carbon dioxide fire extinguishers. As a rough guide, an office may choose to place one CO2 fire extinguisher next to each general purpose fire extinguisher. A workplace with a commercial or large kitchen would also select a Wet Chemical fire extinguisher. Dry Powder fire extinguishers may be found in boiler rooms but fire service advice generally dictates that they are not suitable for indoor areas. Our example here is a two storey office building with each floor having 700 sq metres of floor space. It has a car park attached to the building with space for ten cars. The building has a small sever room but no cooking facilities. This building would have the 4 general purpose fire extinguishers on each floor. We would also recommend a 2 to 4 CO2 extinguishers per floor and one CO2 extinguisher situated in or outside the sever room (Dependent on size). As a training company we would of course also recommend fire marshal and also fire extinguisher training! We hope this fire extinguisher type article has been useful. If you want more information either call or email us.